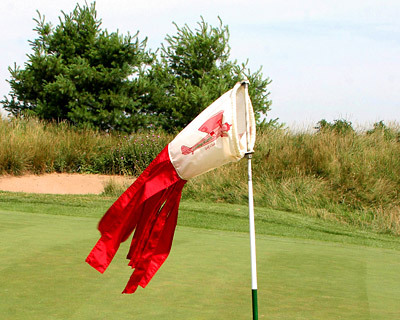 Hailed as a "unique experience", The Landings at Spirit Golf Club is located in the fertile Missouri River Valley of Chesterfield, between the bluffs of Wildhorse Creek and the Spirit of St. Louis Airport only minutes from St. Charles, OFallon and St. Louis. Designed by Roger Null, The Landings at Spirit Golf Club is an 18-hole championship public golf course with links-style zoysia/blue grass fairways and double bent grass greens running from 11 to 13 on the stimp meter. Though the course is expertly designed to be a challenge for the highly skilled golfer; there are five sets of golf tees, the "Super Cub" (blue tees) Super Connie (red tees) Phantom II (gold tees) Harrier II (green tees) and Hornet (silver tees) so that we may accommodate golfers of all skill levels.